Rosario born Argentinean Franco Cinelli has been firmly rooted behind the decks since the tender age of 14. Drawn by the call of the drums and having researched the creation of music through computers and samplers, the mid ’90′s saw Cinelli’s first productions taking shape. Rapidly becoming a key player on the Argentine scene, Franco played throughout the country, holding a residency at the prestigious El Sotano. His first forays to Europe came in 2003, but it was 2005 that his own music really made an impact. Having released a handful of releases and mix compilations on smaller labels, it was his “Picaro” EP with Bruno Pronsato that really brought him to the attention of the music world. Since then, Franco has gone on to release and remix for a number of established imprints including Ilian Tape, Produkt, Claque Musique, Hello Repeat, Airdrop , International Freakshow, Alphahouse and the label of his great friend Kasper, Esperanza. 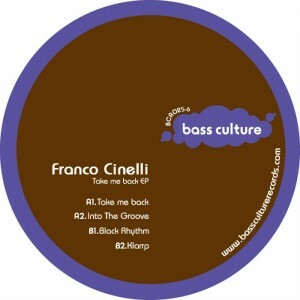 In 2011 following his critically acclaimed “Planet Dub” debut EP on Bass Culture Records, Franco Cinelli finally achieved global recognition with his massive underground remix of Cassius “Sound Of Violence” that placed strongly in many of the end-of-year Top 10 best remix of 2011 lists. Today Franco returns to Bass Culture Records for a new take on his trademark deep & techy house with 4 original tracks on the “Take Me Back” EP. This entry was posted on June 3, 2012 at 12:00 and is filed under Release.